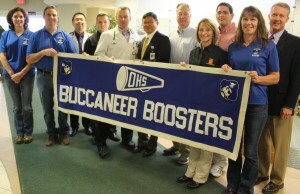 OSWEGO, NY – Buccaneer Boosters board members stand with some of the major corporate sponsors. The Buccaneer Boosters’ mission is to support and to promote Oswego’s student-athletes, coaches and all of the Oswego City School District’s sports teams. 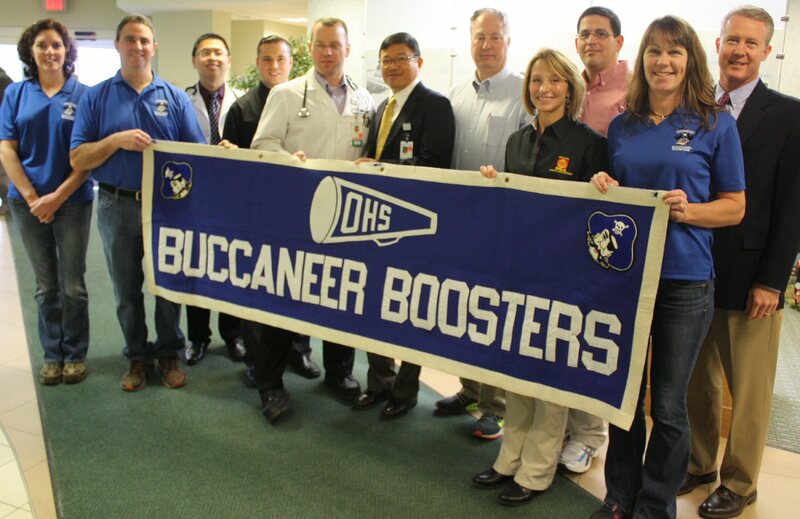 From left are: Kris Armstrong, Buccaneer Boosters board member; Pete Galletta, Buccaneer Boosters board vice president; Oswego Hospital Hospitalist Leanardo Bernardo, MD; Anthony Licatese, of Licatese Chiropractic; Matthew Liepke, MD, Oswego Hospital medical staff vice president; Renato Mandanas, MD, Oswego Health Chief Medical Officer; Robert Morgan, MD, Oswego Family Physicians; Jason Pratt, Oswego Health physical therapy director; Judith Queale-Dunsmoor, Buccaneer Boosters president, Bold Onion co-owner and major corporate sponsor; Meghan Smith, Buccaneer Boosters board member; and Jeff Coakley, Oswego Health vice president for strategic services.